Once gold was discovered and the California Gold Rush began, more than 500 camps, villages, and towns sprang up almost overnight as some 80,000 prospectors poured into the Mother Lode country in 1849 alone. For more than a decade, the flood of people continued to come, arriving overland on the California Trail, by ship around Cape Horn, or through the Panama shortcut. In the beginning, the miners easily gathered the surface gold, scratching more than $10 million from the land in 1849. By 1853 the yield had peaked at more than $81 million before dropping in 1855 to $55 million. 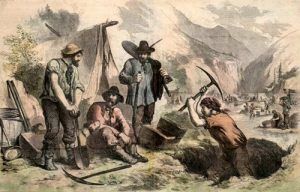 Among these tens of thousands of prospectors and an almost equal amount of claims, tales of “lost mines” began almost immediately as pioneers were killed, sickened, or lost their way back to many of the rich ore finds in the mountains and deserts of the Golden State. Whether these tales of lost mines are fact or fiction, their legends are still alive for hopeful prospectors of California. ©Kathy Weiser-Alexander, updated October 2018.